How long have you been teaching? Is GHMS the only teaching job you have had? I have been teaching since 2006. I started teaching at Dee-Mack High School where I coached High School Boys and Girls Basketball. I then moved to Washington, IL and taught at Washington Central for 4 years, teaching Physical Education and Coaching Baseball, Softball, Boys Basketball, Track, as well as serving as the Athletic Director. I started teaching in Germantown Hills in 2012. I teach Physical Education and Coach Junior High Girls Basketball and 6th Grade Boys Basketball. What made you decide to start DJing? Do you have a background in singing/music? I have always loved music, whether it was listening to it, singing along to it, or just naming the song/artist. I like a wide variety of music genres. I started to DJ a few local junior high dances when I was in high school. I would prepare CD's with songs that were hot at the time and play those. Requests were a lot harder back then, but I had another CD player that I could switch to if a request was made. In 2014, I started working part time for MVP Mobile DJ Services and through that, I decided that I really wanted to start my own company. I have been DJing on my own, for JAK'D Entertainment, for 2 years now. The company name came from my kids' names, Jaxon and Kensley Davis I have been extremely busy with DJing wedding receptions, corporate events, school dances, and hosting Karaoke during these last 2 years. I love DJing on top of being a teacher. I don't have to do it, but I really love doing it so it is a fun hobby for me. How far are you willing to travel for an event? Illinois or out of state? I am willing to travel wherever I need to go. I have traveled to Chicago to DJ a wedding reception for a friend and have also been asked to DJ a wedding reception in Indiana. I base my rates off of the amount of time and work I have to do for the event. Corporate Events and School Dances start off around $250-$300. Wedding receptions with the basic dance lighting and music start around $750 for 6 hours with up lighting, adding an additional charge if wanted. Karaoke usually goes for about $150 for 3 hours. What is the best way to contact you for booking? The best way to get ahold of me is through my Facebook Page @JAKD.Entertainment1. I get all of my business from social media and word of mouth. I have pictures and reviews from people who have used me as a DJ on the JAK'D Entertainment Facebook Page. I host Karaoke at the Home Turf Tap in Metamora every other Friday from 9- Midnight. We are actually wrapping up a 4-week singing competition, "The Turfs Got Talent, this Friday, June 30th with 8 finalists singing for the title of 2017, "Turfs Got Talents Winner," along with a cash prize. I have also hosted Karaoke at the Germantown Grille and The Outpost in Eureka. Thank you, Ryan, for taking the time to do this interview with me. 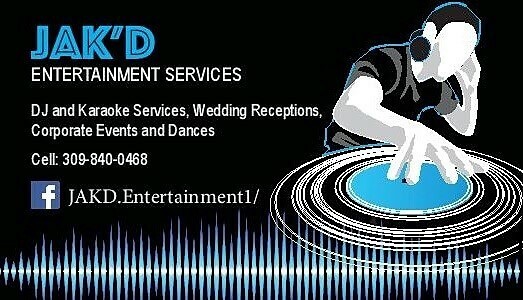 If you need a DJ for a party or reception keep Ryan in mind. [Support small local businesses it is cool. ]If you are interested in seeing him in action, come to "The Turfs Got Talent" contest this Friday. If you want to see and hear me make a fool of myself in public join us at the Home Turf Tap on the corner of N Niles and Rte 116.